Kenny Powers, the star of HBO's hit comedy series “Eastbound & Down” will make a cameo at Daytona thanks to a new promotional partnership with NASCAR Nationwide Series team MAKE Motorsports. In celebration of the HBO series’ season three debut on Feb. 19, the network has taken the unusual step to sponsor the #50 Chevrolet driven by T.J. Bell at DRIVE4COPD 300 at Daytona International Speedway. 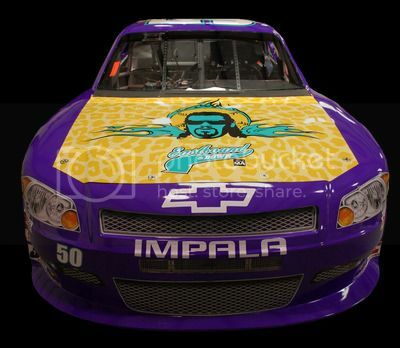 The #50 Eastbound & Down / Make Motorsports Chevrolet features elements of lead character Kenny Powers’ prized jet ski, with a purple and leopard-print scheme, as well as the likeness of the “legend” himself, who also hails from Shelby, N.C.
“The name and likeness of Kenny Powers have long been associated with victory and success,” said Powers. “It’s pretty obvious why somebody would want to put a giant picture of my face on a tastefully decorated stock car. Longtime sponsors Liberty Tire Recycling will be joined for the 2012 season by Gulfcoast Software Solutions, a leading provider of loss prevention software for all types of businesses and facilities. Here's a preview of the car..